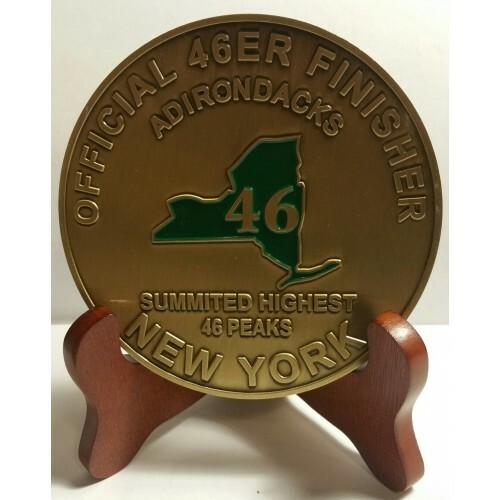 Congratulate the East Coast Mountaineer with this unique finisher marker. This is to celebrate summiting the highest 46 peaks in the Adirondack mountains of New York State. The first 46ers were brothers Robert and George Marshall, and their guides and family friends Theo L. Hooper III and, Herbert Clark. The Marshall's thought up the idea after spending much of their childhood in the region and examining the collection of Verplanck Colvin maps owned by their father, Louis Marshall. They devised criteria for the high peaks they would climb, choosing any summit that was more than 4,000 feet (1,219 m) above sea level in elevation with at least 300 feet (91.4 m) of vertical rise on all sides or separated from the next closest summit by 0.75 mile (1.2 km). They initially planned to climb only the summits above 4,000 feet (1,200 m), of which there were 42, and did so between 1918 and 1924.They climbed the 4,000 ft (1,200 m) mountains later, on the suggestion of friends.At the time that they undertook this goal, there were no trails up many of the peaks, making this a particularly formidable accomplishment. The trio first climbed Whiteface Mountain on August 1, 1918, and finished the 46 with Mount Emmons on June 10, 1925. One of the peaks, Mount Marshall in the MacIntyre Range, has since been named in honor of Bob, and the brook (Herbert Brook) that is the most popular approach has been named after their guide Herbert Clark. As an organization, the Adirondack Forty-Sixers (http://www.adk46er.org/) dates to 1936, when Ernest R. Ryder and Edward L. Hudowalski formed a social club, originally known as the Troy Forty-Sixers, for people who had successfully climbed all 46 of the Adirondack high peaks. The club later expanded its membership, and was formally incorporated by the State of New York as the Adirondack Forty-Sixers in 1948. though the Marker states New York on it we do understand that there are a few of the 46 that are not in New York. You can make this a very personal item by adding custom engraving to the back of the marker. You can have the first and last mountains and the dates, or your own message.